Like any aspect of building your business, creating a strong and visible online presence requires an informed and flexible strategy. The content you create online is neither effective or profitable when you don’t reach the right audience: customers. Content distribution is the field of online marketing that revolves around the way you distribute content through different paid, earned and owned platforms. It’s important that you employ each of these categories, using different channels to reach different segments of your audience where they are. Just as you wouldn’t rely on a single marketing effort in the physical world – like putting all of your marketing spend into a single ad on a single radio station – you don’t want to silo your efforts online. Here, we’ll discuss the different content distribution portals that, working together, can create a strong presence online. Content distribution is an umbrella term for all the ways that you deliver content online to mass audiences. There are all types of content – from blogs to informative web pages, images to advertisements. The way you disseminate these various messages to your clients is grouped based on where the content lives and if you’ve paid to distribute it or increase its visibility or not. Owned media lives on a website, blog, or social media account that belongs to your business. You own your website and/or blog and may also have handles (like @220Marketing) on Instagram, Facebook, LinkedIn, or other channels. Social media is a key component of content distribution that are relatively affordable. Creating a Facebook account for your business, for example, is completely free. You can communicate through this and other social media accounts with your clients and get a good gauge on how engaged they are with your posts (i.e., how many times posts receive likes or comments). When a client asks a question or posts a comment on your business’s social account, you can create individualized responses, all for free. Later, we’ll discuss paid ways you can use social media. Email marketing was one of the first types of digital content distribution, and today it remains a popular option because it’s easily tracked and can be personalized for different segments of your readers. Companies use email marketing to share specials and sales, to drive traffic to their websites, and create brand familiarity among potential and existing clients. Over time, clients will begin to recognize your online presence through your owned media channels. Google and other search engines likewise observe and evaluate your public content as they crawl (scan through) owned media. When it comes to your website, you can improve the way that search engines read and classify your site by using search engine optimization (SEO), which includes strategic placement of keywords and adding “meta data” on the back end of your site. By actively and consistently releasing quality content through these channels, you can improve your ranking and visibility on SERPs (search engine results pages). You can maintain a great deal of control over the content you release through owned media. Releasing content through these channels is typically very affordable or even free. Maintaining a domain name and website can cost just a few hundred dollars a year, while social media channels are typically free, even for businesses. Earned media describes any type of content distribution that occurs when other people online contribute to or share your content. If a customer leaves a Yelp review about your business, for example, that content becomes part of the web of information about your business that exists online. When a review, comment, tagged Instagram picture or other piece of content is positive, that can improve your reputation online. It may also improve your ranking on SERPs when a search engine recognizes that there’s buzz about your business online. Links are another type of earned media in which another website, blog or person hyperlinks to your website or tags your business. This sets you up as a source of information, which can improve visibility and drive traffic. When its favorable, earned media can be a huge boost for your business. Much like word-of-mouth, digital earned media creates reputation and buzz online. It serves as a reflection of your interactions with your customers. It is important to note that bad reviews or buzz online can similarly damage your online presence. Paid media, as its name implies, is a way to reach customers by leveraging pay channels to distribute your content. Paid channels include advertisements, pay-per-click advertising on SERPs (which bring up your business as a top result when certain keywords are searched), and sponsorships. Each of these methods can be very helpful in improving visibility online, usually in coordination with earned and owned media efforts. You can use paid media to drive traffic to your website, to a coupon page you’ve created for a special promotion, or to any other piece of content for which you’d like to improve visibility. 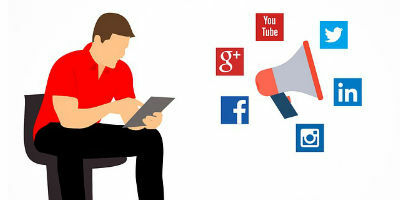 While creating a business page on most social media applications is free, you also have the opportunity to build visibility through paid campaigns. These campaigns allow you to improve visibility among targeted consumers based on their demographics and activity. With this information, you can schedule posts and ads to reach your target demographics at the right time and even track leads. Many businesses choose to work with a marketing professional to create the right combination of paid media efforts. You’ll want to target any paid media to target customers in a specific area or demographic, without paying for visibility in front of people who aren’t likely to ever patronize your business. A marketing specialist can create a campaign using online tools like Google AdWords that will help you get the biggest bang for your buck. One of the most important rules to take away from your efforts in content distribution is to create quality content that your target audience finds valuable. A content marketing specialist can help you create a plan of attack to improve your online presence using this quality content. Ultimately, you can build the right buzz about your company through well-planned content distribution and turn it into real-world business success!